Using the approach developed for integrating Python into Weka, Pentaho Data Integration (PDI) now has a new step that can be used to leverage the Python programming language (and its extensive package-based support for scientific computing) as part of a data integration pipeline. 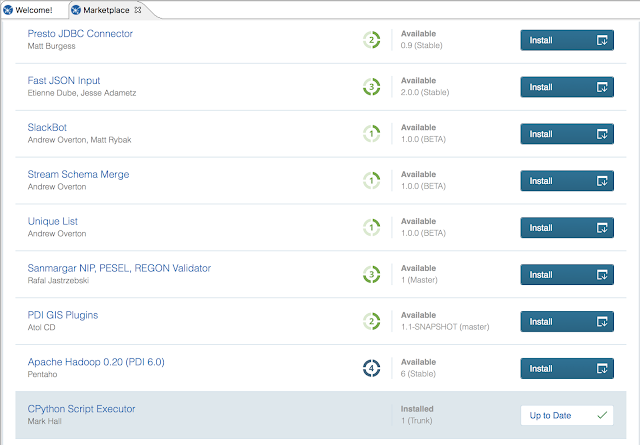 The step has been released to the community from Pentaho Labs and can be installed directly from PDI via the marketplace. Python is becoming a serious contender to R when it comes to programming language choice for data scientists. In fact, many folks are leveraging the strengths of both languages when developing solutions. With that in mind, it is clear that data scientists and predictive application developers can boost productivity by leveraging the PDI + Python combo. As we all know, data preparation consumes the bulk of time in a typical predictive project. That data prep can typically be achieved more quickly in PDI, compared to developing code from scratch, thanks to its intuitive graphical development environment and extensive library of connectors and processing steps. Instead of having to write (and rewrite) code to connect to source systems (such as relational databases, NoSQL databases, Hadoop filesystems and so forth), and to join/filter/blend data etc., PDI allows the developer to focus their coding efforts on the cool data science-oriented algorithms. As the name suggests, the new step uses the C implementation of the Python programming language. While there are JVM-based solutions available - such as Jython - that allow a more tightly integrated experience when executing in the JVM, these do not facilitate the use of many high-powered Python libraries for scientific computing, due to the fact that such libraries include highly optimised components that are written in C or Fortran. In order to gain access to such libraries, the PDI step launches, and communicates with, a micro-service running in the C Python environment. Communication is done over plain sockets and messages are stored in JSON structures. Datasets are transmitted as CSV and the very fast routines for reading and writing CSV from the pandas Python package are leveraged. The step itself offers maximum flexibility when it comes to dealing with data. It can act as a start point/data source in PDI (thus allowing the developer the freedom to source data directly via their Python code if so desired), or it can accept data from an upstream step and push it into the Python environment. In the latter case, the user can opt to send all incoming rows to Python in one hit, send fixed sized batches of rows, or send rows one-at-a-time. In any of these cases the data sent is considered a dataset, gets stored in a user-specified variable in Python, and the user's Python script is invoked. In the "all data" case, there is also the option to apply reservoir sampling to down-sample to a fixed size before sending the data to Python. The pandas DataFrame is used as the data structure for datasets transferred into Python. A python script can be specified via the built-in editor, or loaded from a file dynamically at runtime. 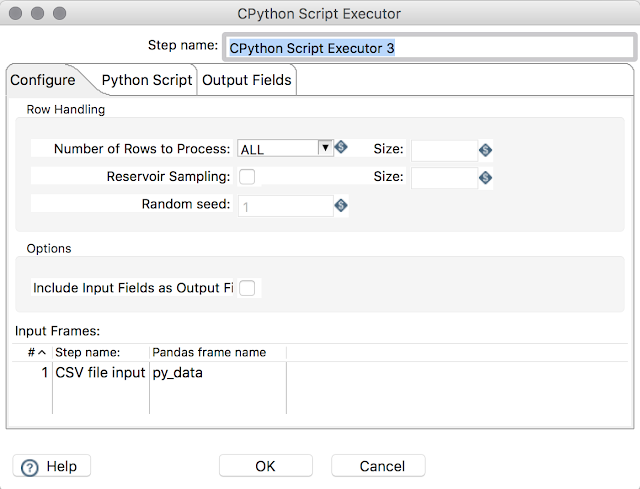 There are two scenarios for getting output from the Python environment to pass on to downstream PDI steps for further processing. The first (primary) scenario is when there is a single variable to retrieve from Python and it is a pandas DataFrame. In this case, the columns of the data frame become output fields from the step. In the second scenario, one or more non-data frame variables may be specified. In this case, their values are assumed to be textual (or can be represented as text) or contain image data (in which case they are retrieved from Python as binary PNG data). Each variable is output in a separate PDI field. 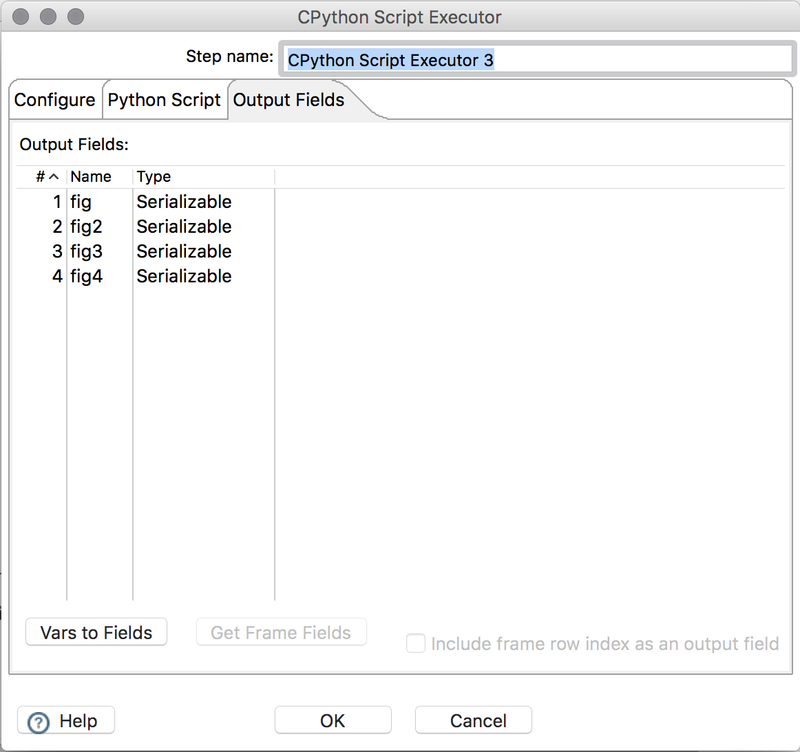 The CPython Script Executor step will work with PDI >= 5.0. Of course, it requires Python to be installed and the python executable to be in your PATH environment variable. The step has been tested with Python 2.7 and 3.x and, at a minimum, needs the pandas, matplotlib and numpy libraries to be installed. For Windows users in particular, I'd recommend installing the excellent Anaconda python distribution. This includes the entire SciPy stack (including pandas and scikit-learn) along with lots of other libraries. The example transformation shown in the following screenshot can be obtained from here. The example uses Fisher's classic iris data. The first python step (at the top) simply computes some quartiles for the numeric columns in the iris data. This is output from the step as a pandas DataFrame, where each row corresponds to one of the quartiles computed (25th, 50th and 75th), and each column holds the value for one of the numeric fields in the iris data. The second python step from the top uses the scikit-learn decomposition routine to compute a principal components analysis on the iris data and then transforms the iris data into the PCA space, which is then the output of the step. The third python step from the top uses the matplotlib library and plotting routines from the pandas library to compute some visualisations of the iris data (scatter plot matrix, Andrew's curves, parallel coordinates and rad-viz). These are then extracted as binary PNG data from the python environment and saved to files in the same directory as the transformation was loaded from. The two python steps at the bottom of the transformation learn a decision tree model and then use that model to score the iris data respectively. The model is saved (from the python environment) to the directory that the transformation was loaded from. 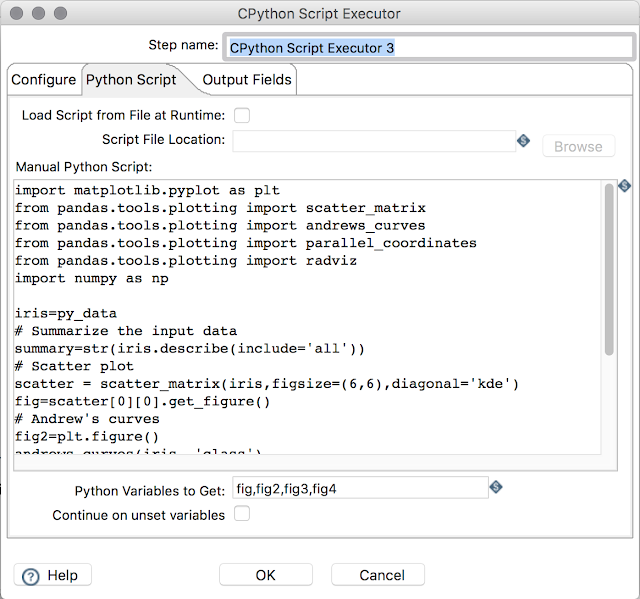 The new PDI CPython Script Executor step opens up the power of Python to the PDI developer and data scientist. It joins the R Script Executor and Weka machine learning steps in PDI as part of an expanding array of advanced statistical and predictive tools that can be leveraged within data integration processes. Great stuff. Thanks for sharing this! Question: Is it possible to pass a JSON string instead of a CSV? Kettle rows are transferred as CSV and materialised as a pandas data frame on the Python side. If your json strings are stored as quoted kettle fields (escaping is probably necessary for quotes in the json itself) then I guess it should be possible to just pull the values out of the rows of the frame on the Python side. We could, in a future release, add an option to the row-by-row mode to simply assign the value of each field in the Kettle row to a separate variable in Python. I am using Anaconda python. I assume that you have the Anaconda bin directory in your PATH? Is Anaconda installed system-wide, or in your home directory? Some people have reported problems with a system-wide installation - something to do with file permissions preventing Anaconda from writing data. Is there a stack trace available on the console or in the PDI logs? Thanks a lot for wonderful job. It is amazing opportunity ti incorporate pure Python script inside PDI. I use PDI 7.0 Community Edition on iOS X and Ubuntu. But sometimes I got a error after saving and trying to open CPythonExecutor step. "Enable to open dialog for this step"
MaxMunus Offer World Class Virtual Instructor led training on Pentaho . We have industry expert trainer. We provide Training Material and Software Support. MaxMunus has successfully conducted 100000+ trainings in India, USA, UK, Australlia, Switzerland, Qatar, Saudi Arabia, Bangladesh, Bahrain and UAE etc. Thanks for making this available. I'm using the CPython Scripting tab in the Explorer interface. I have loaded a csv file into Explorer and this is transferred as a py_data dataframe into the CPython tab and I can inspect the data. However, if I make changes to the dataframe, adding another column for instance, how do I update the data loaded into Explorer? I have tried to write out a csv file so I can load it in again, but this fails with an error. I wonder if you have an example? I need to give rewrittenurl variable the output of my previous step in pentaho. (which is coming from a select values having field name S3link. I am using this step in Kettle and would like to test the use of Script in Python using this step by step of pandas / pivot table. But I'm not getting the same results. I used the example, I got some values, but in some cases I have a number format problem. It should be fairly straightforward. I recommend installing the Anaconda python distribution, because this comes with the few dependencies that are required for the step to operate. Beyond this, all that is necessary is that the python executable is in your PATH environment variable. Note that if you are using OS X you will need to start Spoon via a console using the spoon.sh script so that the PATH variable is picked up (I have not found a reliable way of specifying environment variables in the Info.plist file in an Mac application bundle yet). Another thing to watch out for is permissions on the python side. Some people have reported problems when their Anaconda distribution is installed system-wide. Python occasionally needs to write files and there can be problems unless you are running with elevated privileges. The best thing to do is to install Anaconda locally in your home directory. One annoying thing with the plugin is when the python side tries to ship a unicode string back and a Message Size io exception occurs. At this point (at least in Windows and Spoon) subsequent attempts to run the CPython step fail with a java.io socket exception and I have to restart Spoon to continue to work. This isn't a bug since when the dataframe is properly constructed with ASCII only it works fine. Not sure if that socket can be disposed of somehow. I haven't checked but I get the feeling there is a python process left spinning in limbo. There's a bug in the call to taskkill on Windows -- I've submitted a fix for it. So the restart may be be addressed by that fix for you. Not sure about the Message Size IOException however. Yes, the micro server and the PDI side of things requires UTF-8. I'll have to return to the code at some stage and see if it is possible to recover from a catastrophic failure, kill any orphaned python process and establish a new socket. thanks a lot for the great plugin. I am having trouble executing a ktr with a cpython step in it on a remote (headless server). Executing the ktr locally in PDI (spoon) is working fine, but one I use a remote server as run configuration it is complaining about missing plugin. The server is a headless linux box without the client tools. Is it possible to run a Cpython ktr on such an environment and where do I have to install the plugin? python 3.5 is installed and added to the path system variable. The necessary packages are installed as well. Any hint what might be wrong? Are you sure that the PATH environment variable is available to PDI running on the server (and contains the entry to python)? Perhaps create a simple transformation that prints the contents of PATH to a text file so that you can check. The PATH environment variable can be resolved and contains /usr/bin where python is located and the python --version shows the version 3.5.2 I have installed. Generates a null pointer exception. Any ideas on how to debug that problem? Hmm. The next question would be is python on the server setup the same as on your desktop machine? I.e. does it have the required python packages installed that the PDI plugin requires - pandas, numpy, matplotlib etc.? If you ssh to the server and run the transformation from the data integration installation using the pan command line tool does it work? thank you very much for your support! I had not been aware of the matplotlib requirement. I had installed python using anaconda locally on my laptop, but not on the server. You probably could update the blog post requirements section to include numpy and matplotlib as mandatory. Thanks again for your great plugin and support. It´s really appreciated. Good point :-) I've updated the requirements section. I'm glad to hear that it worked on the server in the end. - The most recent github's CPythonScriptExecutor was downloaded and compiled. I've spent all day long trying to get this step running and I have no idea of what else can be done. I really appreciate any tip that would help to trackdown why this NPE is occurring. Was this running the example transformation from the github project? And I assume that you set the PATH from a terminal, and started PDI from spoon.sh? NPEs are almost always associated with an environment that is not configured correctly. Thank a lot for this plugin. On a windows machine everything works fine (Pentaho 8.0), but on my AWS linux machine for some reason it won't work properly(also Pentaho 8.0). The OS is Ubuntu 16.04 with python3.6.3 (including matplotlib 2.1.1,numpy 1.13.3,pandas 0.21.1 and sklearn 0.19.1). Pentaho is running with root permissions. I've spent some time trying to get the CPython Script Executor step running but at this moment I have no idea what might be wrong. It seems like it is some kind of JAVA motivated Error. Have I missed anything crutial for the setup? Anyhow, try installing scipy. Other dependencies (which you should have already) include: io (python 3), StringIO (python 2), math, traceback, socket, struct, os. json, base64, and pickle. I always use Anaconda python, which has everything and the kitchen sink out of the box. Try "yum install PyQt4 tkinter". Hi Mark, thank you for the plugin. Very strange! I've never seen this error before, and can't reproduce it using my copy of PDI 8. Do you have the latest version of the CPython step (v1.4) installed from the marketplace? I have the latest version, I have downloaded it from the marketplace because my spoon version does not show the marketplace button. When I try to connect the Cpython step to the previous step the program says that no input are recived from the Cpython step. Mark, I'm getting a ` java.lang.ArrayIndexOutOfBoundsException` when the dataframe I pass back is empty (edge case), is it not ok to pass empty dataframes into the stream? Besides, the values in each column within the 100 row table, differ from the output of the previous step. For instance, various string values in the original data table, become "value1", "value2", etc. The reason I care about how Cpython communicates with Pentaho is that, the Cpython generates totally different results from the results generated from pure Python codes. 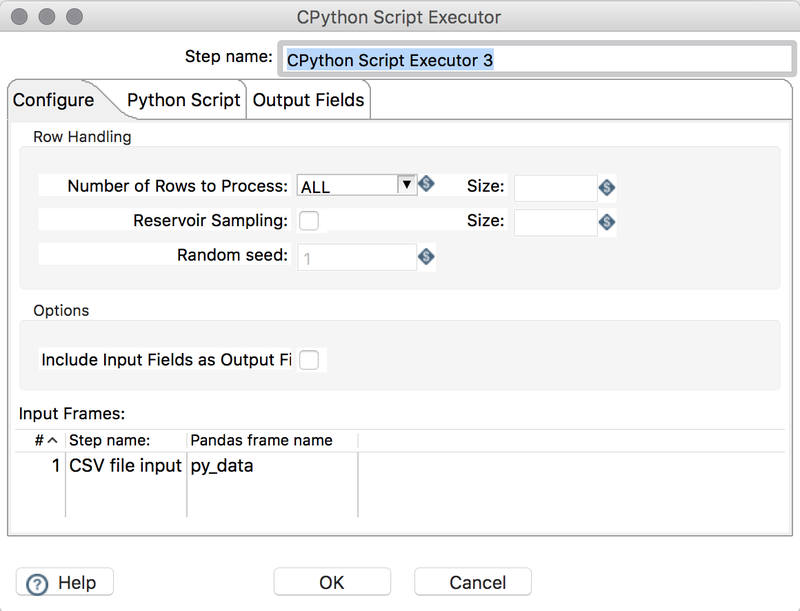 Besides, I am not able to get output from Cpython Pentaho steps which flow into following steps-- I can only generate output via Python codes within Cpython scripts. 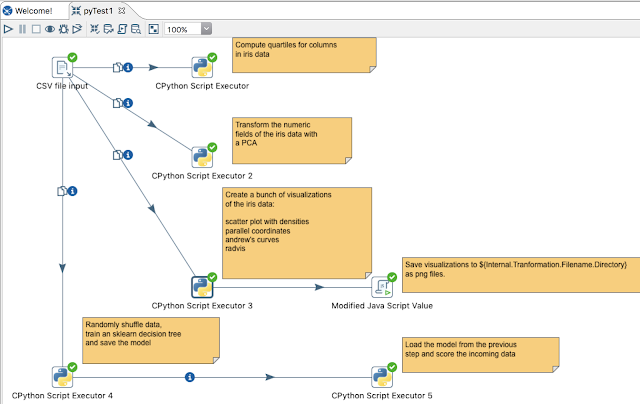 From Pentaho step metrics interface, I see only inflow into Cpython but no outflow. And Cpython step is pending with no finishing status. CPython Script Executor 2.0 - Library "matplotlib" is not avail. There is a way to solve this issue?